I got an email from a friend of mine that directed me to this SUPER cool search engine! It’s called GOODTREE and you start by choosing a cause that you want to support, either curing hunger, providing drinking water, helping stop global warming, etc…and then you use GOODTREE as your search engine and EACH DAY that USE GOODTREE, they DONATE to your chosen cause! 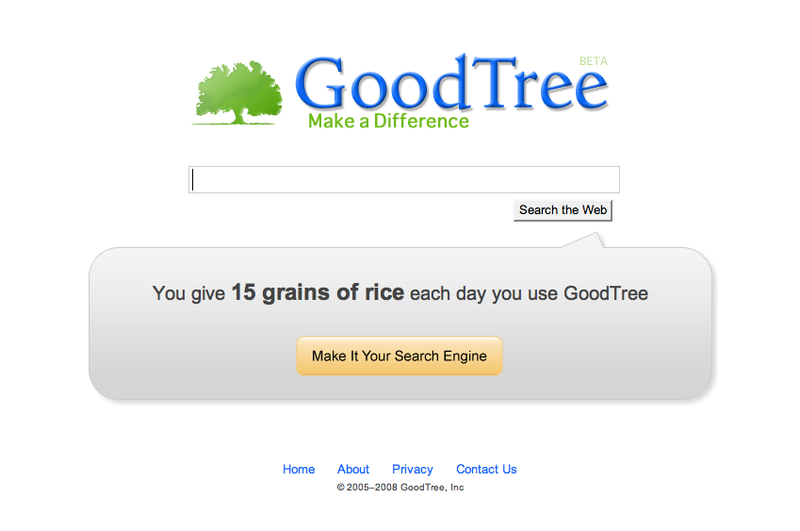 I chose to FEED THE HUNGRY and every day that I use GOODTREE, they donate 15 grains of rice to the hungry! GREAT idea! LOVE IT!!! CLICK HERE TO GET STARTED WITH GOODTREE! It takes LESS than 30 seconds!!! Happy Thursday!! Eh, sorry, not trying to rain on your parade. 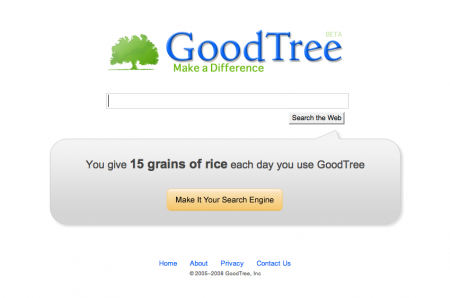 I think it’s a good idea, but the GoodTree donations don’t seem to be very large. But, I’m sure incorporating it into your daily search habit does help those less fortunate. It’s too bad they don’t give 15 grains per search or something vs 15 grains per day.